After a happy winter of worm composting…I harvested my can-o-worms worm castings earlier today, grabbed by my pre-soaked seeds, and went to town planting. This year I am trying the Gurney’s lettuce and radish seed tapes. Will keep you posted on how they well they germinate. I pre-soak and plant them every 2 weeks or so apart. Right now I tend to think they are a bit close, but they are really easy to tuck into the garden quickly so I am more apt to keep planting into late spring. I also really like my little mini-seed-master to plant rows of things like onions, leeks, carrots…little tiny seeds. worm castings, soaked seeds, ready to go! testing seeds in the paper-towel plastic-bag method. On a somewhat related note, I saved a few absurdly expensive seeds from last year, and didn’t ever get around to freezing them. Before investing time, a garden bed and my energy in them I tested them by soaking them and watching their sprouting percentage. Not as complicated as it sounds. Here’s a simple explanation. If you tested 10 seeds from a leftover packet and only six sprouted, you should expect a 60 percent germination rate from that batch. Plant extra to compensate. If very few germinated, buy new seeds for this year. Today I spent the whole lovely day in the garden! My grass is sprouting, my seedlings started inside were planted, and I needed just a few more little peat pots for some things like sunflowers and other warm-starting seeds. In an attempt to avoid jumping in my car I found this cool shortcut to quick starter pots…newspaper seedling pots. I quickly assigned these to my kids to do (which they happily stopped raking and hoeing, got a lemon-aide, and sat down and followed the you-tube video). 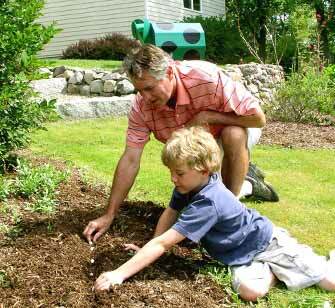 The newspaper will decompose in your garden or you can remove it before setting the plant into the garden. Worried about toxic ink? Never mind that… most daily newspapers are printed with food grade soy based ink nowadays, and even the color ink is made from it…just not the shiny stuff. The only thing to remember is to make sure the newspaper is not above the ground when planting or it will wick the moisture from your seedling. Rather have a picture tutorial than a video…here you go. Or another one here. Save 41 pounds of paper and lots of time…opt out of junk mail. New Rolypigs: We are delighted to announce that the new 2009 model Pink Rolypig Composters are on the water and should be at our warehouse in a month. The new Pink Rolypigs have bigger fixing brackets. The new Rolypigs have adjustable head flanges for easier assembly. They have a one-piece nose which is simpler and stronger. Lastly, the internal partitions are more streamlined for better material flow. We are excited to be bringing in new and improved Rolypigs. The Pledge: Years ago, when I was teaching, we began each year by taking the back side pledge. The pledge is to use both sides of every piece of paper. Since doing the pledge years ago, I have continued that practice on a daily basis. Printing: When we print out orders, they are done on paper with printing on the other side. This practice has meant using half the amount of paper required to run a business. If you have not taken the pledge, do so today! Brill Razorcut Reel Mowers have two bolts and nuts which fasten the handles together. Some folks have found that the threading is not perfect on their reel mowers. To remedy, hold the bolt with a wrench and tighten the nut over the threads when assembling your Brill reel mower. This has happened on a few Brill reel mowers.